My recent convalescence has not prevented my continued acquisition of miniatures. I have two to showcase now, ones I have long coveted. From Vesper-On for their game Carnevale, I managed to obtain their Plague Doctor. He seems to be in short supply at many online vendors, who are apparently expecting imminent restocks. Although the game is set in Venice at the end of the 18th century, I believe this costume/disguise/uniform works just as effectively for the end of the 19th. Reaper also has a Plague Doctor figure, but to me it looks practically modern in its dress. 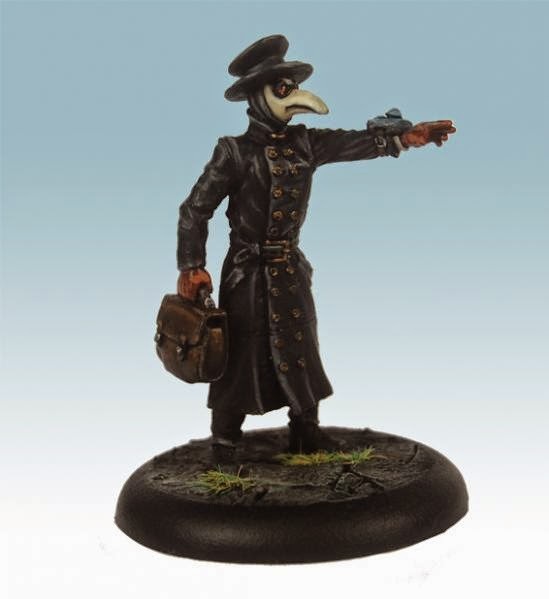 The painted plague doctor from Vesper-On's website. Also long on my must-haves list was Ingrid Rangvaldottir and her Mirror Golems, for Wolsung from Micro Art Studios. Despite the fact that she's depicted as elven but will be human in my Brass and Blood setting, I had to have her. I mean, look at those boots! And her automata are as adorable as can be. A little filing of those pointed eartips should do the trick. The picture from Micro Art Studio's website. My unpainted (as usual!) 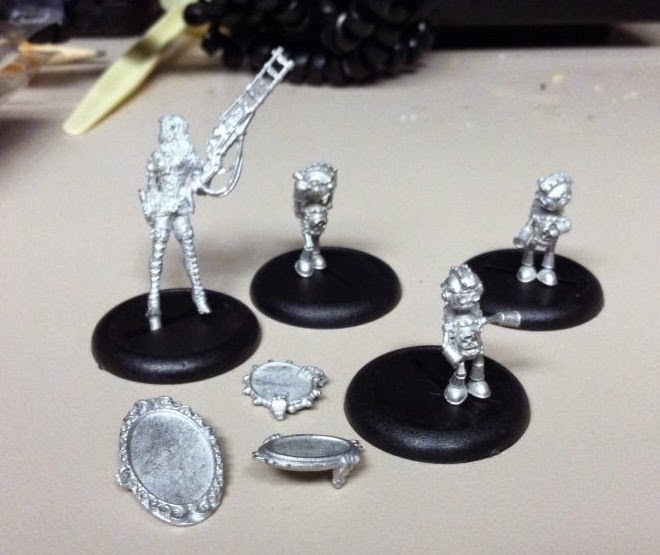 minis for Ingrid and her golems. 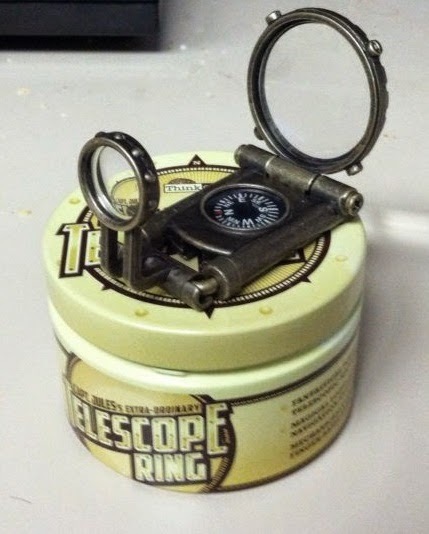 I also recently bought a piece of steampunk jewelry. I ordered my wife one of ThinkGeek's new Con Edition Bags of Holding and added this while I was shopping their site. It's their exclusive Capt. 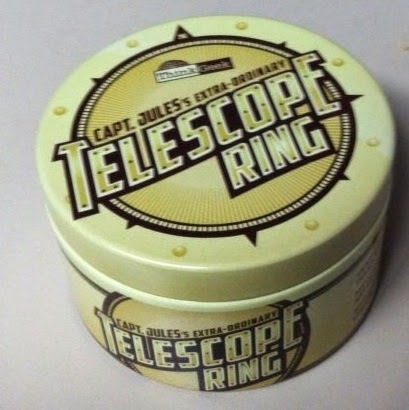 Jules' Extraordinary Telescope Ring. Here's a set of photos I took showing it in action. but the largest fits my index finger. It's too big for my ring finger, which is a size 11 (U.S.). Additionally, I have made some further steps in cementing my place on the Interwebz for Brass and Blood. "Establishing my brand" as it were. Sorry that none of it has yet appeared on the site, but that's next. I first ordered some of the cards from Vistaprint that use their free templates. I got this nice vintage-looking card for Dispatches from the Rim, and a box of 500 cost me a little over $12 including shipping. So this time I ordered a "premium" set from them. Several nice little touches -- the different background, the printed reverse side, a matte finish and a leather business card case -- added up to about $50, including shipping. Well worth it, and I think they turned out beautifully. If you can't make out the text in my amatuer picture there, It says "www.brassandblood.com / Dark denizens vie for power in a steampunk London beset by the preternatural." The back of the card lists the main divisions of the storyline I've envisioned so far. You can think of them as novels in a trilogy or stages in a campaign, whichever -- because they're both. The "Tales of Brass and Blood" I have planned so far are "Black Blessings," "Bleak Beatitudes" and "Red Rapture." For more details, check the Brass and Blood website later this week. 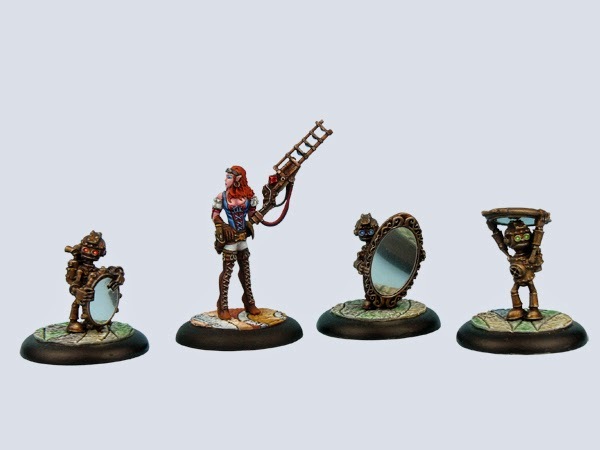 Oh, and I also got my FLGS, Moxie Games, to order a Hordes Circle Orboros P3 paint set for me. So I promise, some painted minis soon! Or eventually! Or at least someday! OK, cats and kittens, that's it for tonight. Back to the boards, everyone, and I'll see you across the table soon! I love the mirror golems too, more than the girl figure in fact. Oh you had cards made! I did indeed. I hope they have the impact I anticipated once I get to start passing them out. Congratulations are in order on so many levels. The plague doctor is a great figure and the telescope reminded me of similar such things found on the back of comics when I was a lot younger. Thank you, sir. 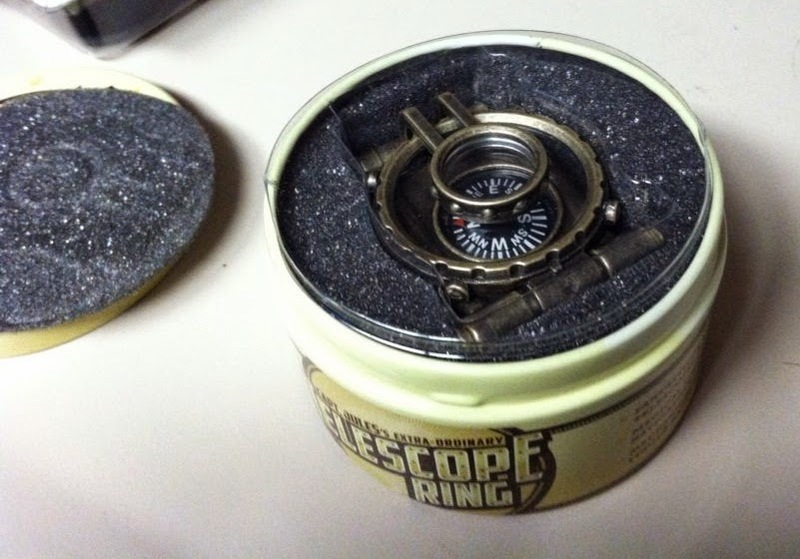 As for the telescope ring, I certainly hope it fares better than those sea monkeys I ordered from a comic book ad. It's all looking good dude! Will there be zombies in "Brass and Blood"? Of course there will, Bob! 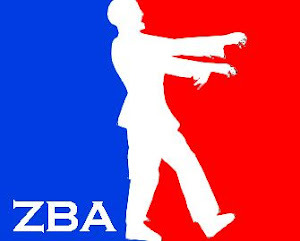 I absolutely love zombies and could not imagine creating a milieu that didn't at least have the POSSIBILITY of an invasion of the undead. 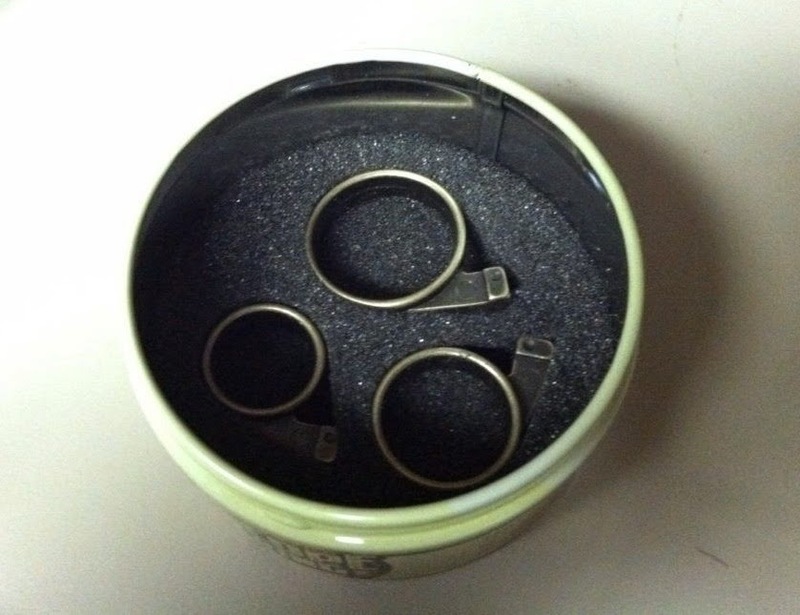 That ring looks awesome as do the mini's! Thank you! Can't wait to get them assembled and get some paint on them. The Carnevale stuff is really great looking, but some of the models are very fragile. It might not be your kind of thing, but the game is worth giving a go as well! Thanks for the heads-up about the fragility of the Carnevale models. I have a copy of the rules but have never played it. I was even a backer of the doomed kickstarter had for a second volume.